Zoom on the experiment it Borde, whose project, libertarian Utopia, permanent revolution, laboratory of the artistic movements and policies of the years 1960-1970, the social and therapeutic practices innovating and critical of the very whole company, were to treat the madness differently. The private clinic of Borders founded by Jean Oury and a group of young psychiatrists, influenced by the psychiatric revolution of the Forties, then per May 68, sought “to make live the patients all while curing them”. This movement, whose psychoanalyst Felix Guattari was a vibrating figure, took into account the creative and productive dimension of the madness, and redrew, while being torn off with repressive dimensions of traditional psychiatry and psychoanalytical conformism, of new relationship between looking after and neat. Calling into question the hierarchies, the divisions of the labour, it placed the institution like centers therapeutic device. Borders or the right to the madness is luminous strolls with the private clinic Borders It, which leads us to the meeting of the patients, Jean Oury or Guattari and a collective life inventing itself. Meetings of word, around film being done, the time which runs, a certain form of softness, the palpable Utopia order the setting in scene of film. “Together we incarnate only one body which does not belong to anybody, the body of the ground” Min Tanaka. 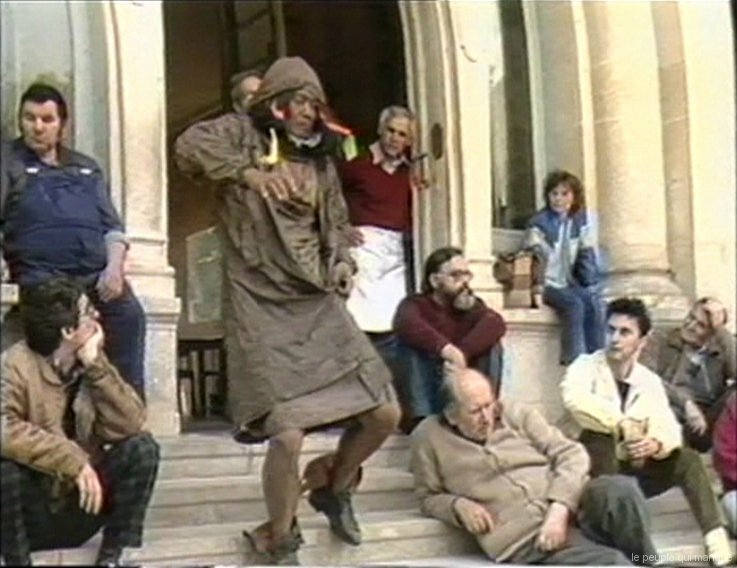 “Atmospheric Variation”, “unperceivable molecule”, from its “laboratory of meteorology of the body”, the large Japanese dancer butô Tanaka Min, at the same time human and animal, mineral and vegetable, child and old man, insane and beggar, causes the emotion of the residents of Borde, and offers, by its chaosmic dance, a single experiment which touches with more close the unconscious collective and the secret forces of the universe. François Pain is realizer and author of many films related to the experiments of alternative psychiatry. Large accomplice of Felix Guattari, it worked during seven years with the private clinic of Borde. He takes part in the epopee of the free radios (1977/1981), cofounder of the Federation of NonCommercial Free Radios and Radio Tomato. Cofounder of “Unchained Channel” (1991) and of “Chaosmédia”, (1994) associations of which the goal is to develop a theoretical reflexion on the topic of the media, as well as an approach different from the production and audio-visual diffusion.